There’s snow in patches on the ground, the temperature can’t quite decide what it wants to do, you’ve already downhill skied to your heart’s delight…what is left to do?! Gaylord has the answer for you – WINTER RAFTING! 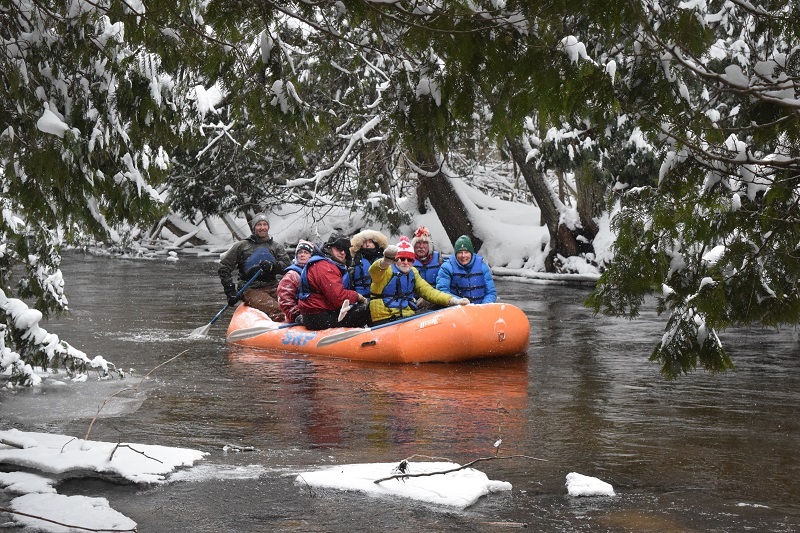 No winter trip to the Alpine Village is complete without experiencing one of northern Michigan’s hidden gems, rafting the scenic and serene Sturgeon River. With Sturgeon River Paddlesports in Wolverine and Big Bear Adventures in Indian River, a quick jaunt north will be well worth the hours of fun and entertainment provided! Winter rafting trips give you the opportunity to float through some of the loveliest, most peaceful forests in our area. Imagine yourself surrounded by cedar and pine trees, their verdant branches draped with crisp, white snow. The only sounds are the bustle of wildlife (yes, you’ll see plenty) and steady rush of water along the frozen banks. Sounds pretty fantastic, doesn’t it? First and foremost, no, you will not get wet. Well, there might be an occasional little splash, but this is not a wet and wild ride where you emerge looking like an icicle. Winter rafting is a safe activity for the whole family. While the Sturgeon River boasts the fastest current in the Lower Peninsula, you will be in good hands with an experienced guide. Newbies are always welcome! Don’t let this adventure pass you by because you only have land legs! Your guide will teach you everything you need to know, including when it’s time to paddle and when it’s time to just sit back and watch the world go by. Dress for winter fun, which means snow pants, a warm jacket, hats, gloves, etc. Most importantly, bring your friends, your family and your camera, because you will want to remember and share this truly unique outdoor experience.